Although the new US government claims the official visits of its top officials to a number of Middle Eastern states were aimed at discussing regional issues, expansion of mutual ties, and the fight against terrorism, it is crystal clear that Iran has been the main focus of these regional visits and talks. The top members of US President Donald Trump’s government have initiated their activities in the field of foreign policy by setting off on overseas tours of other countries. According to a Farsi report by Etemad newspaper, [new] US Defence Secretary James Mattis opted for East Asian countries of Japan and South Korea as his first destinations, whereas, the new director of the country’s Central Intelligence Agency (CIA), Mike Pompeo, initially spent two days in Turkey and, then, set out for Saudi Arabia. A full report of Ankara’s complaints about the performance of the former US government was all that was published in media about Pompeo’s visit. Turkish officials criticized Washington’s insistence upon not extraditing the US-based opposition figure Fethullah Gulen, who is accused of organizing 2016 Turkish coup d’état attempt, and the White House’s support for the [north] Syrian Kurds, whom Ankara views as a threat, during Barack Obama’s term in office. Although not given a hint about by international media, it is crystal clear that Iran’s name has been mentioned in Pompeo’s meetings with Prime Minister Binali Yildirim and President Recep Tayyip Erdogan. Perhaps, the proposal put forward a few days ago by Turkish Foreign Minister Mevlut Cavusoglu concerning the need for greater unity among Turkey, Saudi Arabia and the US to fight against terrorist groups in the region, was also among the issues discussed in the meetings between Turkish officials and the new member of the Trump administration. Amidst ambiguities about Trump’s policies towards the Middle East, Pompeo travelled to Riyadh and primarily met the Saudi Crown Prince Muhammad bin Nayef bin Abdulaziz Al Saud, who although has not played a significant role in formulating the Saudi government’s policies over the past few years, is still quite popular with different US governments. At the beginning of his meeting with Pompeo, Muhammad bin Nayef, who is also deputy prime minister and minister of interior, said the relationship between the US and Saudi Arabia is historic and strategic, stressing any plot aimed at destroying this strategic relationship is doomed to failure. He also stressed the Saudi government’s determination and policy to continue its fight against terrorism. 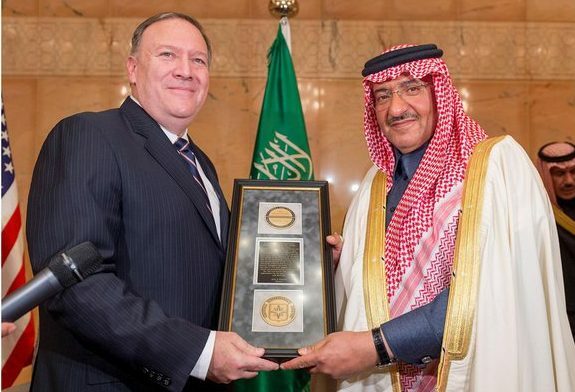 Also over the course of his Saudi Arabia visit, Pompeo honoured Muhammad bin Nayef with CIA’s prestigious “George Tenet Medal” for his “intelligence work in the fight against terrorism” at a reception ceremony in Riyadh on February 10. Addressing the ceremony after receiving the medal, in a statement, Muhammad bin Nayef said he appreciated the CIA honour and framed it as a recognition of what he called Saudi Arabia’s anti-terrorism efforts under the directives of King Salman bin Abdulaziz Al Saud. “The kingdom has been keen to combat terrorism based on its conviction that terrorism has no identity and no religion, and from its belief that the terrorists are committing these acts stemming from their deviant ideologies and evil thought,” he stated. Pompeo has become the first top official of the new US government to visit Saudi Arabia. A week prior to Pompeo’s visit to Riyadh, Trump had held extensive talks on a number of regional issues with Saudi Arabia’s King Salman bin Abdulaziz in their first phone conversation. In this phone call, King Salman invited Trump “to lead a Middle East effort to defeat terrorism and to help build a new future, economically and socially,” for Saudi Arabia and the region. The Trump’s move to select Saudi Arabia as one of his cabinet members’ first destinations in the Middle East, came as he had harshly criticised the US traditional allies in the region during his election campaign, stressing that the Persian Gulf littoral states, themselves, are required to bear the costs of creating a safe zone for protecting Syrian refugees. The US president had also repeatedly said that US allies are required to meet all the expenses involved in ensuring their security on their own, addressing both a number of the European and Persian Gulf littoral states. Nevertheless, the sole priority the Trump administration has, to some extent, clearly identified so far with regard to the Middle East, is its determination to fight the ISIS and other terrorist circles in the region. 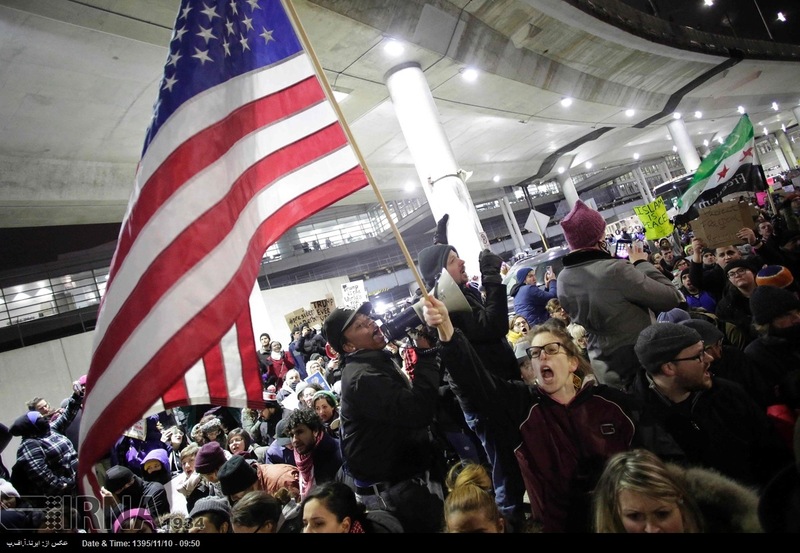 Other US state officials have also repeatedly stressed the importance of the US administration’s priority. The US government’s resolve to fight terrorism in the Middle East region is what the Saudi government has capitalised on to get closer to the White House. Pompeo’s visit to Saudi Arabia came as, Trump had signed an executive order to temporarily suspend immigration from seven Middle Eastern and North African countries, including Iran, to the US only a few days after coming into power as the American president. The ban has, currently, been suspended by a number of US courts of appeals. Interesting about the order is that Saudi Arabia and the UAE were not on the list of the banned countries. This is while, the two countries’ citizens were closely involved in the September 11 terrorist attacks in 2001. Following the issuance of the executive order, Saudi Arabia and the UAE, feeling blessed due to not being included in the list, remained silent and did not react to it. Their silence came as, even Washington’s European allies, the United Nations and the Arab League slammed the order as discriminatory and racist. Among the other members of the [Persian] Gulf Cooperation Council ([P]GCC) who did not react to Trump’s ban were Bahrain, Kuwait and Oman. The main policy Al Saud pursues by investing in the new US government is to secure the country’s support for Riyadh’s efforts to curb Iran’s activities in the region. In addition, due to its prolonged (almost two-year) military siege of Yemen, Saudi Arabia is currently beset with a host of economic problems which heighten its government’s need to foreign investments. Unlike the [P]GCC members which opted to remain silent and do not risk their interests, in a phone conversation with Trump, Iraqi Prime Minister Haider al-Abadi criticised the travel ban. Tensions with Iran were also mentioned in this phone call. In addition, on February 11, al-Abadi said Iraq will not take part in any regional or international conflicts. “Iraq is very keen to preserve its national interests […] and does not wish to be part of any regional or international conflict which would lead to disasters for the region and for Iraq,” Abadi told state TV.